Oregon Small Claims Court - Getting Started - Owens / Pinzelik, P.C. Posted on October 9, 2013 December 29, 2016 by Brook Wood. Filed under: Civil Litigation. Tagged: civil litigation, oregon, small claims. At our firm we often get calls from people who want to file or need to defend a lawsuit in small claims court, and who want some basic information regarding the process. While we do not mind taking these calls, we thought we could help many more people by publishing some of this information here. Here, then, is some basic information on how to start your Small Claims case. Mind you, we are aware much of this information is already available elsewhere on the internet but, apparently, it isn’t as easy to locate as it should be. If you still have questions and would like to schedule an appointment with one of our attorneys to discuss your small claims case, as plaintiff or defendant, click here. 1. What is ‘Small Claims Court’ anyway? Small Claims Court is a simplified venue for civil cases in which the amount in dispute is relatively low. The rules of evidence are relaxed and there are no attorneys to appear on behalf of the parties (though you are permitted to seek the advice of an attorney outside of the courtroom before the hearing). The purpose of Small Claims Court is to quickly and fairly resolve modest claims, while minimizing the financial burden on the parties often associated with legal disputes and making efficient use of limited judicial resources. 2. What cases can be brought in Small Claims Court? For a case to be eligible for Small Claims Court in Oregon the amount in dispute, including the value of any property, must be $10,000 or less. So, if you are a contractor, suing a non-paying client for $10,001, you may not file in Small Claims Court. If you are suing for more than $10,000, you must file your suit in the Circuit Courts. Additionally, in Oregon, with some few exceptions all claims of less than $750 must be filed in Small Claims Court. Also, to file a Small Claims Court action you must first genuinely attempt to resolve the matter with the opposing party and swear to the Court under penalty of perjury that you did so. 3. Who are the parties in a Small Claims suit? Just as in Circuit Court civil suits, the party that files the lawsuit is called the Plaintiff and the party being sued is the Defendant. The Defendant can bring counterclaims against the Plaintiff but is still called the Defendant. 4. How do I file a Small Claims case? The Plaintiff begins the Small Claims case by filling out a Small Claim and Notice of Small Claim form. (For Multnomah County forms, click here.) The Plaintiff files this form with the Small Claims Court of the county where: a) at least one Defendant resides; b) the injury or damage occurred; or, c) the Defendant was supposed to perform some contractual obligation. In Multnomah County this form is filed at the Small Claims counter in Room 210 of the Multnomah County Courthouse, 1021 SW 4th Avenue, in Portland. There is a filing fee that must be paid when the form is filed with the Court. The fee is $53 for claims of $2,500 or less, and $95 for claims between $2,500 and $10,000. 5. What else do I need to do? Before the Defendant(s) can be made to show up to Small Claims Court, the Plaintiff must serve (provide notice to) the Defendants regarding the lawsuit. There are a few ways this can be accomplished but generally if you know the Defendant’s home or work address the easiest is to take a true copy of the Small Claim and Notice of Small Claim form to the sheriff’s office of the county where the Defendant resides or works. The sheriff’s office will deliver the copies to the Defendant and provide you with a Proof of Service that you must file with the Small Claims Court. There is a fee charged for this service that varies by county. 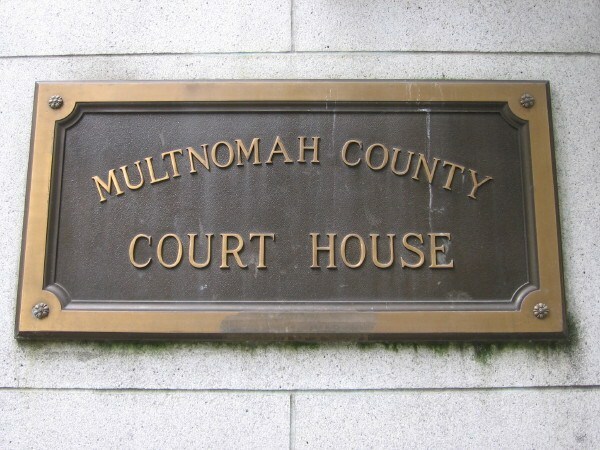 In Multnomah County, you can call the sheriff’s office at (503) 988-3291 or simply stop by their office on the first floor of the Multnomah County Courthouse. After doing all of the above, the Plaintiff must then wait to see if the Defendant will voluntarily pay the claim, request a hearing, demand a jury trial (if you are suing for $750 or more the Defendant can demand that you file your suit in Circuit Court), or ignore the whole thing and hope it goes away. Obviously, this isn’t everything to know about Oregon Small Claims lawsuits. For more , feel free to check out the information provided by the Multnomah County Circuit Court here, or by the Oregon State Bar here. Again, if you wish to schedule an appointment with one of our attorneys to discuss your small claims case, as plaintiff or defendant, click here.